This post was sponsored in partnership with Millennium Blend. All views are my own of course! One of my favorite things to do is to come up with new protein bars. Part of the reason is we live on them! 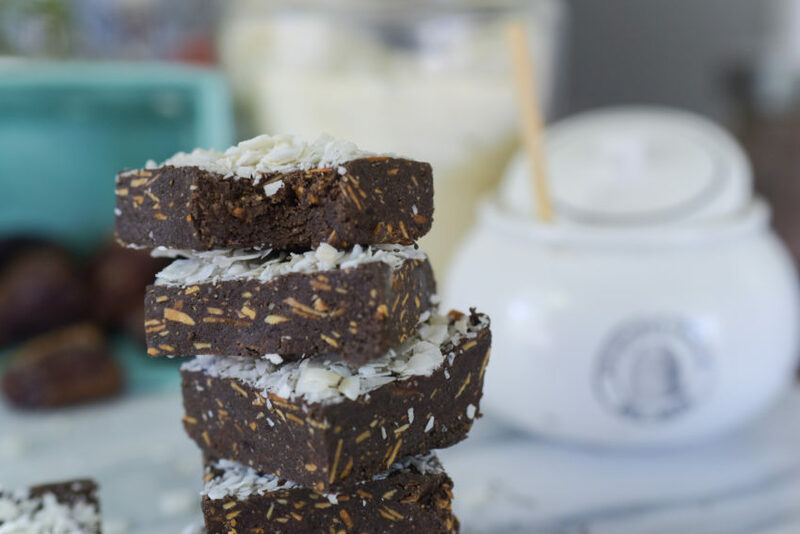 I find that they fulfill such a nutritional component for times where you need a quick snack that really serves as fuel – especially in the summer. 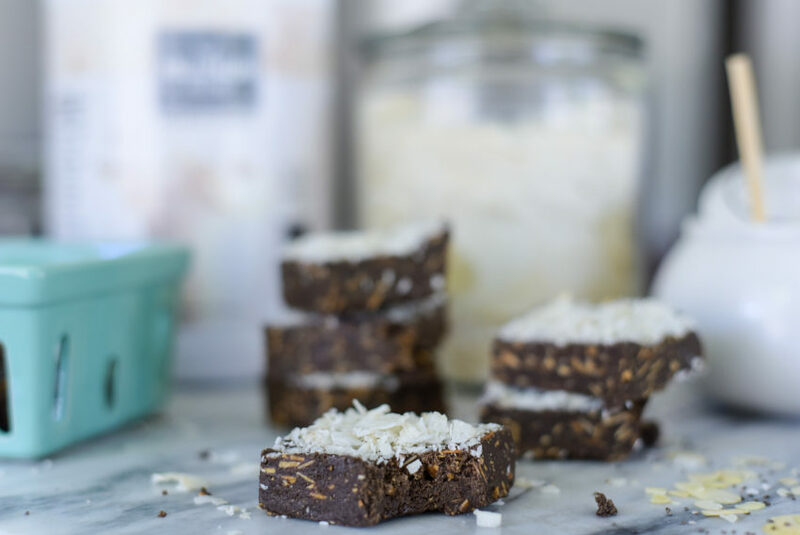 However, more and more people are asking me to create protein bar options without grains. …and you know I love a challenge! 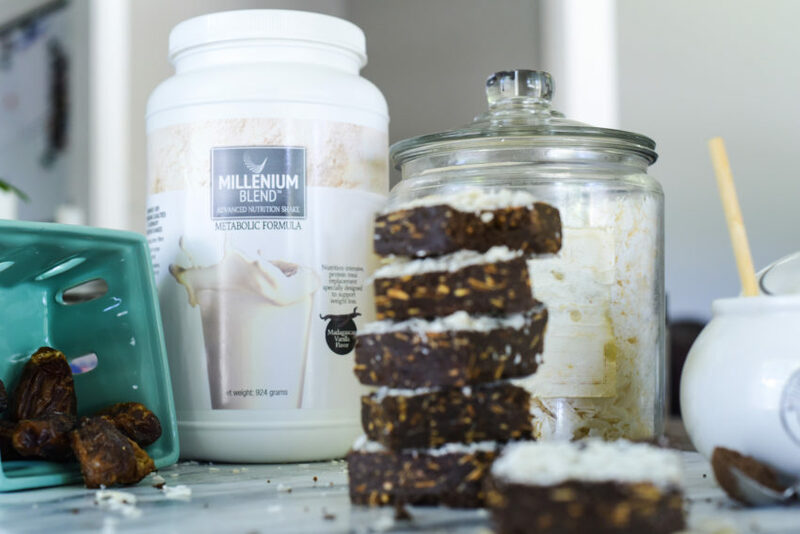 So, when Millennium Blend sent me their protein powder to create a recipe with, a grain-free protein bar was on the list to create! And I LOVE what I came up with…. This protein powder has 25 grams of protein per serving, along with it is 7 grams of fiber…a good bit being soluble fiber, the kind that is often missing from our diet. Soluble fiber absorbs liquid in the gut, helping keep the gut healthy & clean. Speaking of that, this stuff also contains a shelf-stable probiotic as well as effective enzymes. It was developed by a physician….and has a wonderful vanilla flavor! 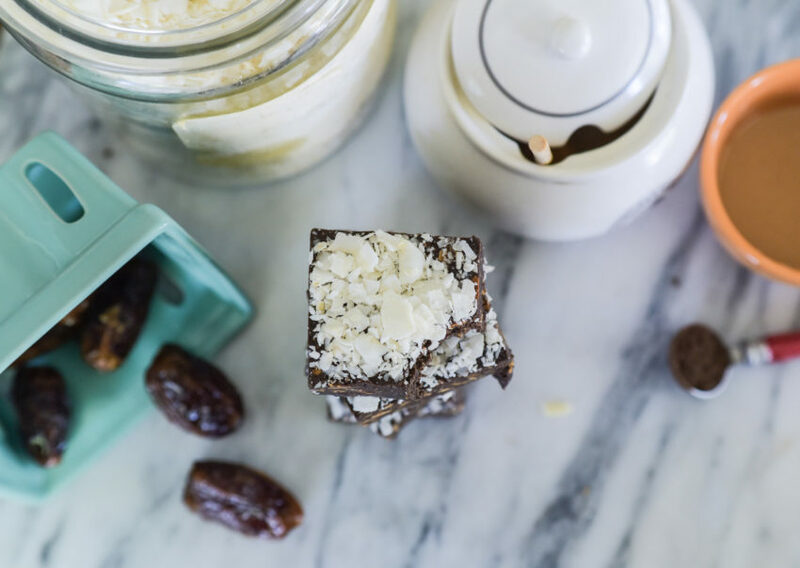 For these protein bars, I sweetened them with dates (another high-fiber food! )…and a little raw honey just to hold them together. Only use as much as you need. Then I tried to pack them with healthy fats, using natural unsweetened PB, chia seeds, and sliced almonds. These ingredients provide you a good dose of nutrients to keep you full, and give you lots of vitamin E and Omega-3s. Double chocolate was on my list, so cocoa powder in addition to some chopped dark chocolate did the trick. And they are so delicious! 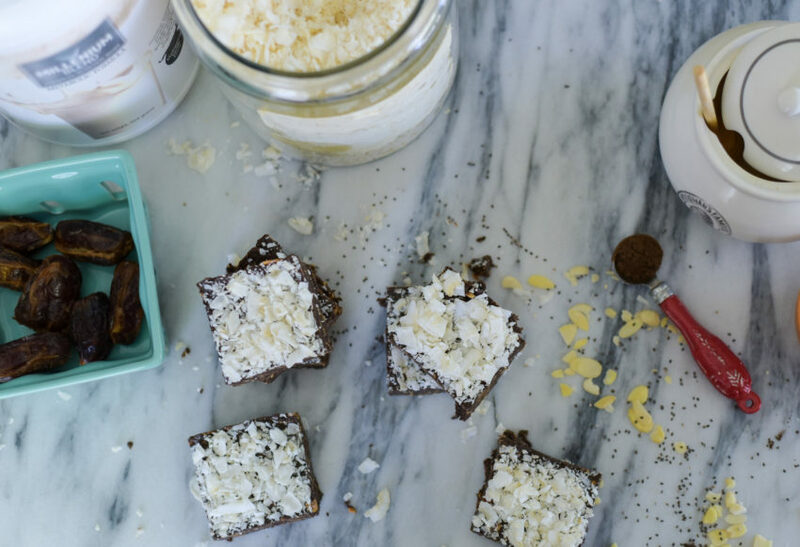 Keep in the refrigerator for a chewy, energizing protein bar. Millennium Blend is offering a 10% discount…click here! Please let me know how you like them! And, I love to see what you create! If you snap a pic, tag me on Facebook, Instagram or Twitter. I give out free health tips there and always appreciate having positive-minded people to connect with! This protein powder would not be recommended for those with lactose intolerance. 1. Roast almonds in a 400 degree oven just until light brown and toasted. 2. In a food processor, add dates and turn on processor until dates are chopped up into little pieces. 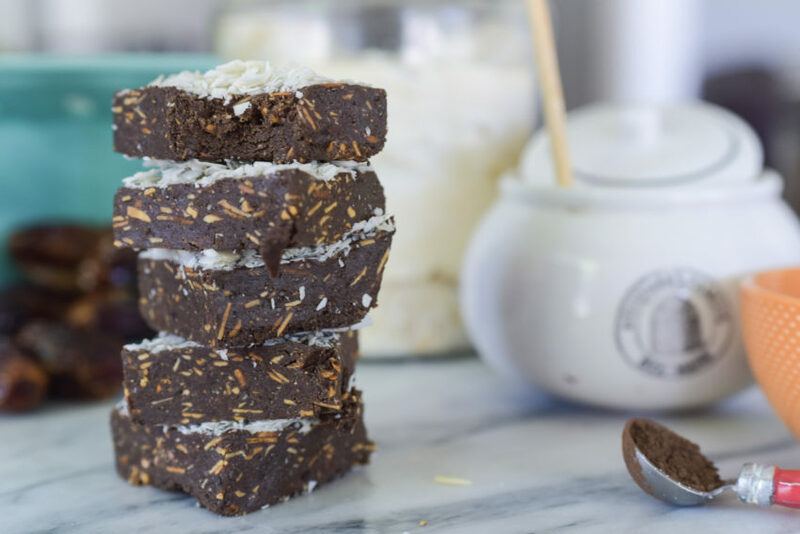 Add peanut butter, protein powder, cocoa powder, honey and chia seeds. Process until evenly combined, scraping down the sides as you need to. 3. Add roasted almonds and dark chocolate to the processor. Pulse 2 times, just until almonds and chocolate are gently mixed in. Chocolate may melt slightly, and that is a good thing! 4. Press mixture into an 8×8 pan lined with parchment paper, and top with plenty of coconut to cover the top. Refrigerate until solid (or, you can freeze them for 20 minutes!). Cut into 12 bars or squares, and keep in an air-tight container in the refrigerator. Enjoy! How many calories per bar would you say? Gave some to my vegetarian friend and her eyes lit up with yummi…. Nancy, that is so awesome to know!!! I’m glad your friend loved them.